My latest op-ed, title above, appeared in The Virginian-Pilot last Thursday. In it, I looked at the results of last Tuesday’s special elections and how the outcomes were pre-ordained based on the partisan composition of the districts. Although it may have appeared that I was picking on Marcus Calabrese in my earlier post, I really wasn’t; instead, I was just pointing out the uphill climb he faced. 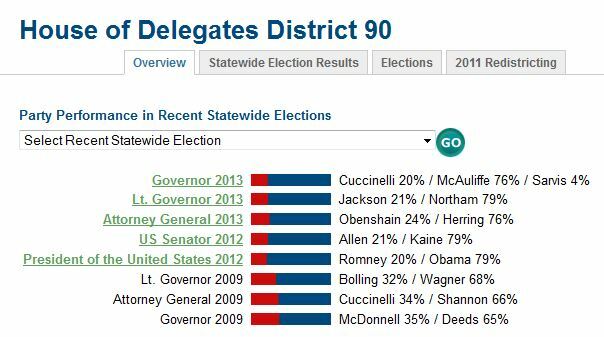 The 90th was drawn as a heavily Democratic district. In fact, when you look at Tuesday’s results compared to past elections, they are right in line. Demographics of a district don’t change that quickly. If anything, this district is trending more Democratic. Short of a scandal, an upset in most of the districts in the legislature – and Congress, by the way – is unlikely. To casual observers, Virginians may appear to be schizophrenic, voting for Republican control of the legislature, a Republican-majority congressional delegation, and Democrats in the five statewide offices. Peeling back the layers, though, the first two outcomes are possible only due to partisan redistricting. Despite claims to the contrary, Virginia is neither a Republican nor a Democratic state. Looking at statewide results in 2012 and 2013, all of the contests were competitive, defined as where the margin between the candidates is less than 10 percent. The same should be true for the legislative races – or, at least, the majority of them. As citizens, we have to demand better. Although I didn’t mention it in this column, One Virginia 2021 is a place to start. Next Post Hampton Roads is Ready for Hillary!